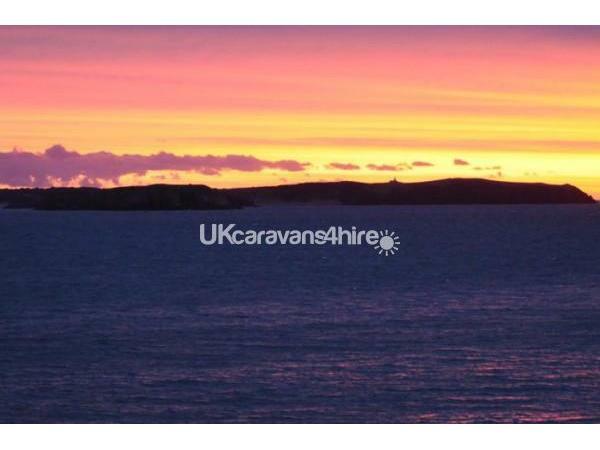 The caravan is situated on Lydstep Beach in the centre of Haven Crest having uninterrupted views of the bay and Caldey Island. It is a two-minute walk to the shops, launderette, children’s adventure park and site office. It is also a close walk to the very modernised entertainment complex. 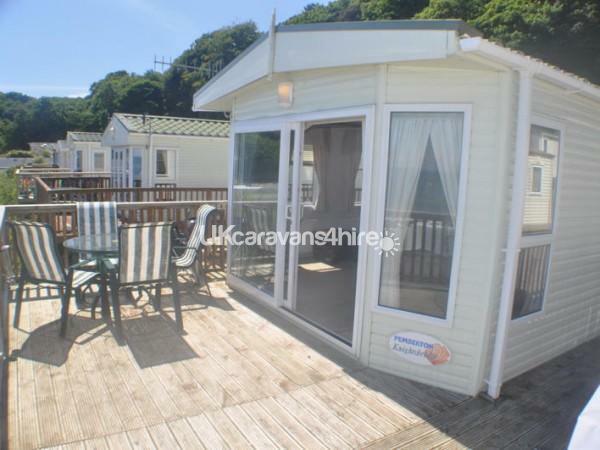 The caravan consists of car parking for two vehicles and a very large veranda. 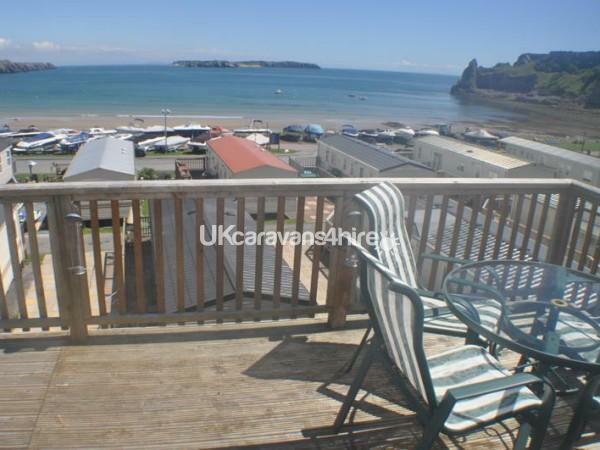 On the veranda is BBQ and patio furniture where, with a glass of wine in hand, the beautiful view of Caldey Island, the Gower coast and on a fine day the coast of Devon too, can be enjoyed. The caravan has two bedrooms, both with king sized beds. One bedroom is served by a bathroom and the other is an ensuite bedroom with shower. Also featuring a fully fitted kitchen with dining table, a very large lounge with leather suite and a 37inch LCD Samsung flat screen TV with pod stand and speakers. 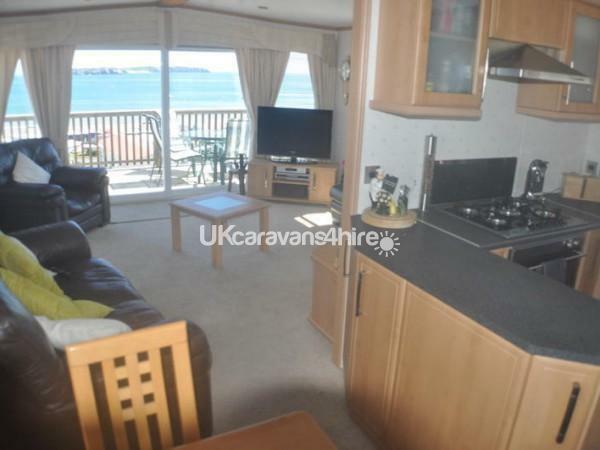 The caravan has full central heating and double-glazing therefore available to rent all year round. 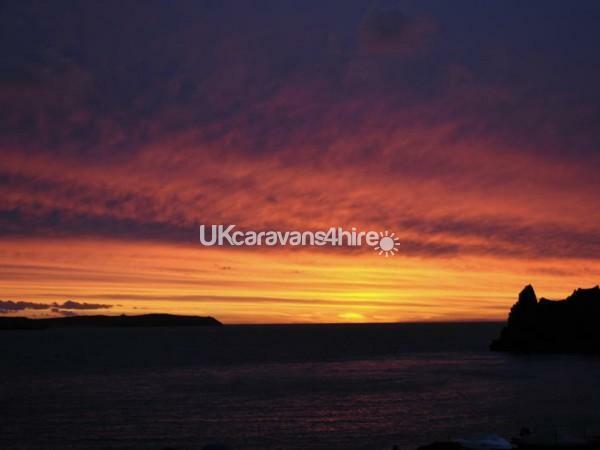 The caravan is close to the coastal paths and very near to all local beaches. The park also operates a boat and Jet ski launching service which is booked through Lydstep Park but you must have relevant RYA and insurances. Because this is a family caravan, we have a no smoking policy but smoking of course is allowed outside. We also have a no pets policy because a family member is allergic to animal fur. We hope despite the no smoking and pet ban you will enjoy our caravan as our family and grandchildren have had lovely times there. Beautiful place and caravan site. Didn't rate the caravan any higher as it was dirty and very dusty, fans were clogged with dust, cutlery and dishes were dirty in the cupboard- we chose not to eat in the caravan because of this. Leaking bathtap with a constant trickle. No bath mats to stand on when getting out of the shower/bath. Very rundown decking, we couldn't let our 7 and 2 year old play on it because there were loose boards and missing spindles to the front and side and with a 30 foot drop in front obviously couldn't risk it, the patio set was put in front of the missing spindles to try to disguise this which I thought was extremely dangerous given the height. Also terrible communication with owners regarding payments, arrival times and the return of the £100 deposit. We can't wait to return to Lydstep but would never stay in this van again. Booked a last minute deal and so glad I did. This caravan was fantastic, hard to believe it’s not new the standard of it is so good. Liked the extra touches, solotaire drove me insane as couldn’t complete it, but there is all the cleaning materials you could need, extra toilet roll and kitchen rolls, from staying in caravans a lot this is very much appreciated. It’s stocked with plates and cutlery for about 20 people maybe, we ate in a lot and the saucepans were good quality to cook with again that’s not often the case. Oh and the beds, so comfortable slept the best in a long time. And then the final wow, the view and the decking, cup of tea out there in the mornings sets you up for a good day no matter what. The caravan was fantastic. The views were outstanding and our stay was perfect. We couldn't give this caravan anything but top marks in all categories.